View Poll Results: What model ti do you own? my ti is so 'base' i don't even have ASC..
oh wait, that's a good thing! What's the difference between a club sport and a sport? I have an original 1998 TI broucher and it doesn't list the club sport as an option. I also have ASC, but I thought that was standard. Since you don't have the standard active options, OBC, cruise, you can rule out active. The 15" wheels would mean you have a base. 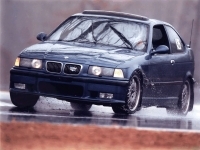 If you had M-technic trim, it would be a Sport. I had a California Roof in my 98. It really liked that option. Yeah, the roof is what sold me on this car. I was thinking that my 15" wheels were not stock because they are 10 spokes and I thought stock wheels were five spokes? What does the M-technic trim look like? I was able to dig up a Vehicle History Report that I got from the dealer. Here's some info from it. I'd really like to know what 9830 is. It's shows up in the model code and as an option. No luck with Google or searching 318ti digest archives. Here is a photo of my 1998 Sport with California Roof. The front bumper shows the M-technic trim which is also used on the luxury M3 package. Here's a photo of mine. It's similar, but not quite the same....and no foglights. Actually, I'm in the US...the euro plates are purely cosmetic. tipsyaj: if you ever have it replaced tell me.. i'll find a way to put that puppy in my 'ti'. muahaha.. I have the 95' model Sport. The one that looks like the active package on the outside. Can someone help me I am new to the site and I don't know if I have a "Sport", "Active" or "Base". I have a '96 Boston Green ti, w/cruise, moon roof, no fogs, 1.9L, 4sp. automatic or tiptronic manual, OBC, witham/fm cassette prewired with factory plug for direct connect CD changer and I have upgraded from the ten spoke 205-60-15's to the seven spoke 205-55-16's off of the 2000 323i. I have seen a couple of similar ones here without the skirts and front spoiler painted, when I purchased mine they were already painted. Are there any other engine specs I should know about? This is really a cool site! My guess is you have an Active. If you had M-technic trim I would say you had a Sport. Being that you have cruise and OBC I would say you have an Active. Cruise and OBC was standard with the Active although available as options on the Base and Sport. I just purchased a Club Sport model from a dealer in Ft. Colllins Co. It is a nice car, I love the color hellrot (bright red), and the red/black interior inserts. I will try to post some pictures of it later today. This is my first bimmer and I love it! When I was looking at the car at the dealership a BMW driver honked and waved as he went by. That suprised me, with my Acura Legend no one else even knew what it was. I never had a driver of another Legend wave or anything, even if I waved at them.